South Korea is a hotbed of cutting-edge cell phones - but its largest phone maker is hoping an iPod rival won't be lost in translation after the iPhone launches. SEOUL, South Korea (Business 2.0 Magazine) -- You'd think anyone making cell phones these days would be freaked by the impending launch of the Apple iPhone. But sipping on cold plum tea at a cafe in downtown Seoul, Kyungjin Lee doesn't seem too worried. Lee, the assistant manager of Samsung's mobile design group, believes his company's recently launched UpStage music phone has just as much -- if not more -- to offer American customers who want talk time and tunes on a single device. Samsung's UpStage merges two different devices - a cell phone and an MP3 player - by giving each its own side. For the UpStage, which launched on Sprint Nextel's (Charts, Fortune 500) network in early April, Samsung came up with a clever solution to delivering both: The front of the new device has a traditional number keypad for making calls. Flip it over, though, and you'll see an iPod-like interface with its own 2.1-inch screen. Some wireless wags have dubbed the two-faced UpStage the "mullet phone." 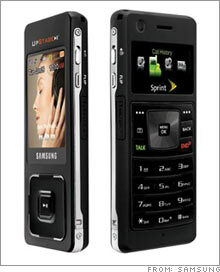 Like the infamous hairstyle, Samsung's music phone is business in the front, party in the back. The price, however, is all business: $149 with a two-year contract, which is less than a third the price of Apple's cheapest iPhone. For people used to one-sided devices, the UpStage may take some getting used to. Imagine fumbling for your phone in a pocket or purse -- and then finding you still have to flip it around to answer a call. But Lee, the lead designer, says that the two-faced design was key to keeping the phone portable and useful. "The idea is rather to have people carry around two devices, we wanted to get two functions in one device," says Lee, the lead designer of the UpStage. "But it was also important to keep it thin so people could carry it around in their pockets." That's in part because music phones are still hard to find in the United States - and few customers are calling for them. While nearly 75 million phones with MP3 features were sold in Asia last year, a mere 20 million were snapped up in North America, according to research firm Gartner. What's more, a recent survey by based Forrester Research revealed that only six percent of U.S. mobile users consider the ability to play music a "must-have" feature on a cell phone. Apple's first attempt at an iPod-phone hybrid, the much-derided Motorola Rokr, never took off, and may have turned off potential buyers to the idea of a music phone. That may change with the launch of the impending iPod. If Apple continues its successful iPod marketing strategy, expect a saturation-bombing marketing campaign that should help popularize the idea of phones that double as MP3 players. While Samsung's not likely to match Apple's ad spending, it's possible that those who can't afford the much-anticipated device's $500-$600 price tag will likely turn to other, cheaper phones, especially now that Samsung and others have simplified their designs to make them easier to use. "The out of box experience has also improved," says Avi Greengart, a principal analyst with research firm Current Analysis. Though Greengart calls the Upstage's design "challenging," he says the extended battery life and slot for adding memory cards helps to provide a complete music solution straight out of the box. If the UpStage takes off, it could bring a much-needed boost to Samsung partner Sprint. Lee and other Samsung execs expect that the UpStage will boost sales from Sprint's online music store. Unlike the iPhone, the UpStage will download new songs wirelessly, a feature that could boost Sprint's revenue from music sales and data-plan subscriptions. Sprint is also dropping the price of its songs from $2.50 to 99 cents, the same as Apple's iTunes. "Music is a big driver of mobile data," says Pete Skarzynski, senior VP of strategy at Samsung's U.S. cell-phone subsidiary. "But people don't want a device that shortchanges you -- the UpStage is a perfect blend." The UpStage is hardly the first attempt to meld a cell phone and an MP3 player. In fact, Skarzynski claims that Samsung was the first to integrate an MP3 player with a phone five years ago. 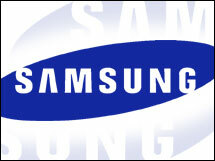 Since then, many Samsung rivals have entered the market. Nokia (Charts) is pushing MP3 functions in more and more of its phones, though those are mostly sold overseas. Sony (Charts) Ericsson's Walkman phone line has been more successful than Sony's standalone MP3 players. And analysts say LG's Chocolate, which launched last year on Verizon (Charts, Fortune 500) Wireless in the United States, has also been a hit, selling 10 million units worldwide. In the United States, though, no phone has made a dent in Apple's iPod market share. Could the UpStage be the one? Or will it fall before the iPhone's might? In Seoul, Kyungjin Lee's hometown, the UpStage is a no-brainer. Data plans are common, networks are fast and reliable, and Korean consumers are used to listening to music on their phones. But the Samsung phone designer has his sights set on the booming U.S. market too. And while Lee may not be showing worries about the iPhone, he'd be foolish not to envy the iPod's success. "We want to set a trend," says Lee. "The consumers will be the judge, but obviously we hope to have that kind of impact." Michal Lev-Ram, a staff writer for Business 2.0 Magazine,blogs daily about the wireless industry.